Your beautiful country home has so many things to offer your family including the backyard pond. It’s where you like to hang out when you have some quiet time to yourself. 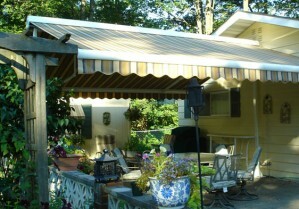 The back porch has the beautiful Eclipse retractable awning attached to the house to keep everyone cool when having lunch or just hanging around with friends. You love the way your Eclipse Shading Systems® retractable awning keeps the indoors cool too because it doesn’t let the heat of the sun radiate through the windows and walls. With the money you save on energy bills, you decided to create even more of a backyard get away. Your particular private place to go sit for afternoon naps, a little fishing, or relaxing with a book is way out back near the pond. Right off the dock, you had an Eclipse retractable Butterfly Awning mounted in concrete with surface base plates and you know the rugged galvanized steel frame is strong and reliable. It’s like having an extra room by the pond and it’s all yours. The Eclipse Butterfly is a freestanding double-sided retractable awning that will create shaded space for you and your family to enjoy on sunny days, providing the best protection from UV sun exposure. When you do get happily stuck out there with a sudden light rain, you know your weather resistant Sumbrella awning fabric will keep you dry. This spring you added the Eclipse Solar Beam Infrared Heater and the Eclipse Lunar Lighting Package to your Eclipse Butterfly motorized retractable awning system because you have every intention of using it into the evening and into fall. This is your quiet time and your private space, by the backyard pond, under the Eclipse 2-sided retractable Butterfly Awning.